In Battlestations: Pacific you don't just have a chance to play on the side of Japan, you can experience a World War II where Japan wins the war. The game features both a U.S. And Japanese campaign in the game, both built around historically authentic archived missions. "Authenticity and historical accuracy we take quite seriously, for the U.S. campaign that's fine and well, but for the Japanese campaign we didn't want the player to lose no mater how well they do," said Alastair Cornish, a designer working on the game for Eidos. "So they based the Japanese campaign on the real war plans, but with Japan winning." The developers also had to figure out how best to illustrate the briefings. Each of the U.S. missions kick off with a bit of actual historical footage from the engagement players are about to take place in. "With the Japanese briefings we had to pick historical footage that shows similar engagements," he said. 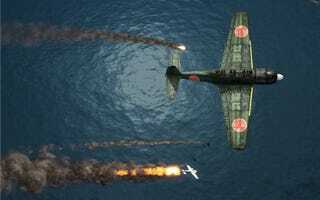 The Japanese campaign of Battlestations: Pacific starts with the country's attack on Pearl Harbor and finishes with the "conclusion of the war for Japan." Cornish declined to say how specifically the campaign ends for Japan. The U.S. campaign starts with the conclusion of the Battle of Midway to the conclusion of the war. Players will be able to play either campaign first or jump between them as much as they want to at checkpoints. Cornish said the game doesn't have intersecting missions between the two campaigns. "We wanted to avoid intersecting missions," he said. "It's the wrong approach to have the same 14 missions played from the different sides. It would feel like reused content. Every mission is completely distinct."